Sally Lane is a huge pass thru reverse living townhouse with six queen bedrooms all beds are "Heavenly" Simmons pillow-top mattresses! One mile to the Old Mill. You get the entire place, both connecting sides. ABVH optional cleaning fee is such a big hit with our clients, for two decades! Complimentary Organic coffee beans with grinder. Towels, linens, even blow dryers, shampoo and local, hand crafted goat milk body soap are waiting for you. 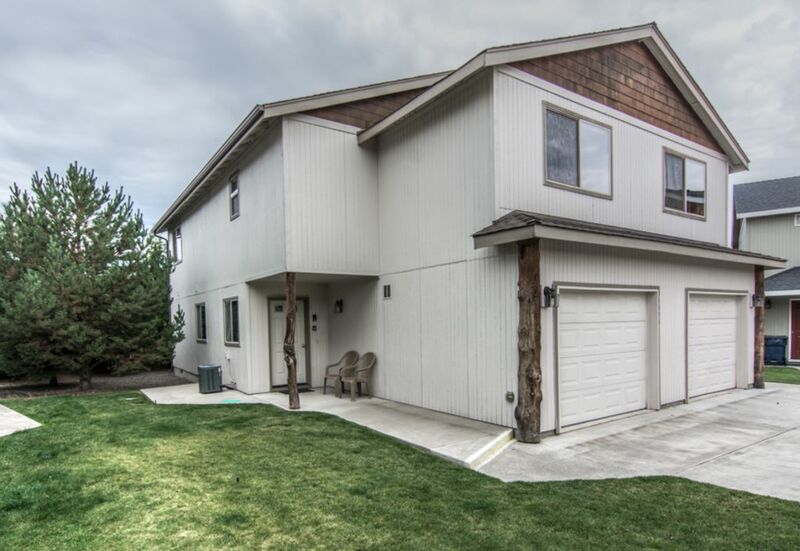 Our home has mountain views and sits one short mile from the Deschutes river and Old Mill in the heart of Bend. Walk to the Deschutes River Trail or a large, fun, community park for kids. HUGE and ready for you and your team, group/multifamily vacation, right in the heart of Bend. We have another large home about one mile from this one for larger groups to be accommodated in two homes in close by. This price will not be beat! 6 Hotel rooms in Bend would easily be two or three times this amount! No home in Bend sleeps more people in queen beds for this price in Bend! Upstairs living area with two full kitchens and seating for 14. The home backs to the road leading to The Old Mill District. 2800 sq. ft., six bedroom home with adjoining living rooms, ideal for large family gathers or perfect for school teams. Four full baths and two half-baths. Two full kitchens and dining rooms, with open floor plan. Big Screen television with cable, (one each in the masters and living room) VCR/DVD player. Wireless internet. Reverse living, laundry room, two bedrooms, and full bath on ground level. Large entry way with storage for all your play equipment. Living room, dining room seats 8 (plus 2 at the counter), kitchen, master bedroom with full bath and walk in closet, 1/2 bath all upstairs with Mount Bachelor views. No persons, outside of registered guests are permitted at the home. NO social gatherings (parties) permitted. No smoking of any kind on the property. The Old Mill along the river where there are dozens of stores, restaurants and 16 plex movie cinema. Float the river in the summer or listen to the outdoor concerts at the Les Schwab Amphitheater . All within walking distance. Minutes to the Factory Outlets, Mt Bachelor Ski Resort, (approx. 25 miles), Deschutes River, local breweries and downtown Bend. Service for 16 people total. Limited parking of 4 vehicles only at any one time. This parking rule is strictly enforced. 2 small cars park in the garages and two larger vehicles in the driveway, not blocking the sidewalk or street. Other cars owned by guests may not park in front of the home. On street parking available throughout the neighborhood in legal parking fashion. *BENDS ONLY CLIENTS CHOICE for cleaning fee! Leave all the linens and towels laundered and kitchen areas as you found them (including dishes) with exception of final dusting, vacuum and sanitizing done by our staff for no cleaning fee charges, OR we provide cleaning at the rate of $250.00 at the time of booking. Authorization only of damage deposit held on your credit card at the time of booking. The kitchens must be left in good order and all trash and food removed from the home regardless of the cleaning fee option you choose. 7 night min. stay during the month of July and Christmas week. One Mile to the Old Mill and Amphitheater. Sally Lane is one mile to the Old Mill and Dechutes River trail. Cable TV (4), VCR/DVD, CD/M3 Player, Full Kitchens (2), Two single garages w/openers, No Smoking on property ANYWHERE. No/limited on street parking. Do not block driveways.